It looks like Android 4.4.3 is on the move. We've already seen it start to roll out to Nexus devices, and the soak test has begun for the Motorola Moto X. Now, it is already time for Google Play edition devices to start getting the newest Android update, and of that group of devices, the Samsung Galaxy S4 is the first to start getting the update. As we know by now, the update is mostly under-the-hood improvements to security, stability, power profiles, and general bug fixes. The one outward-facing update is a refresh to the Dialer app UI. The change log hasn't been released, so we don't know if there are any hardware specific fixes for the Galaxy S4 GPe. We have also seen indications that Samsung is testing the Android 4.4.3 update for the Galaxy S5 and the Galaxy S4 LTE-A, but there has been no word on when to expect those updates. 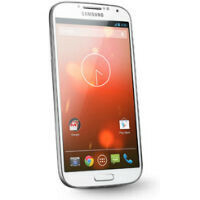 And the Galaxy S5 GPE is coming when? When is the VZW Galaxy S4 going to get the update?